Can the Original Protector Hide You from Photo Enforcement Cameras? 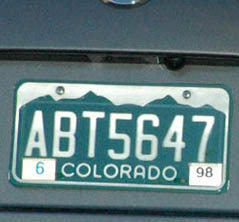 Photo radar camera violation photo of Colorado plate behind Original Protector plate cover. Rating: "...ineffective"
See how the Original Protector compares with similar products. The Original Protector license plate cover is offered as a defense against only photo radar. From an extreme angle, it obscures all of the license plate characters. But once the viewing angle has become steep enough to make that happen, the effect is like flipping a light switch. Cops can spot this cover from the other side of a six-lane freeway. Like the other plate covers tested, the Original Protector can be used with a license plate frame. Combined, the pair looks like it belongs. Without the frame, some may feel that the naked plate cover calls attention to itself. Unfortunately, the Original Protector works only at angles exceeding about 35 degrees, making it ineffective against red light and speed cameras. For the same reason it has no effect on photo radar.